The content of this article provides interesting history, facts and information about the Decline of the Colosseum. What happened in Rome. 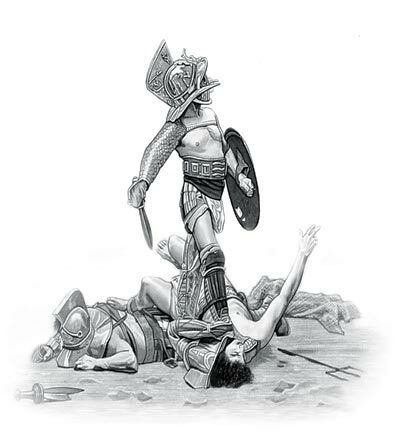 Why did the gladiatorial games stop? What happened to the Roman Colosseum? What caused the ruin of the colosseum? Why was it allowed to fall into disrepair? What was the reason for not rebuilding the Roman Colosseum? The Decline of the Colosseum started when the Gladiatorial games were stopped. The last known gladiatorial fight took place during the reign of the Emperor Honorius (reigned 393 - 423AD). The catalyst for this change was was an Egyptian monk named Telemachus who had newly come to Rome and visited the Colosseum in 404AD. He objected to the savage bloodshed and slaughter in the arena and the midst of the bloodshed shouted for it to cease in the name of Christ. He was stoned by the outraged 'mob' and killed. Three days later the Emperor issued a decree that the gladiatorial games were to stop. Less violent events such as hunting events continued to be shown until 523AD. The advent of Christianity led to a massive change of attitudes in the Roman Empire. The Roman culture changed from being antagonistic to becoming pacifistic. With the new Christian religion the morals, principles and values of the Romans changed. At the height of its popularity the cost of the gladiatorial games at the Colosseum came to one third of the total income of the Roman Empire. The emperors who followed Honorius at first commissioned repairs to the Colosseum but as its political importance declined, together with the wealth of the Roman Empire, so did the enthusiasm for spending money on repairs. Constant warfare required heavy military spending. The Roman government was constantly threatened by bankruptcy and the emperors spent money on wars. Storms, lightening, fires and earthquakes were the natural disasters which struck the Colosseum leading to its decline. The Colosseum was damaged by lightening and fires but an earthquake shook the ground so severely that parts of the upper stories and eventually the entire south wall fell. Although seriously damaged by two earthquakes in the fifth century, it is generally held that the Coliseum was practically intact in the sixth century. The later, catastrophic, earthquakes of 847 and 1231 caused the most stones to fall. The precious metals such as gold and bronze in the statues, inscriptions and decorations were the first, most valuable items to be plundered. All of the marble which covered the walls, stairs and floor of the Colosseum was plundered and re-used. As the Colosseum declined stones and marble were plundered and reused for other constructions. The steps of St. Peter's in Rome are made of reused Colosseum stones. The outer wall of the Colosseum is estimated to have required over 100,000 cubic meters (3,531,466 ft) of travertine stone which were set, without mortar, and held together by 300 tons of iron clamps. It has been calculated that 300 tons of metal were used just for the clamps. This metal was plundered during the Middle Ages to make weapons. The holes where the iron clamps once were can now be seen throughout the whole structure of the Colosseum. It is ironic that when the Coliseum stood in grave danger of demolition it was saved by the belief that it should be left as a constant reminder of the Christian Martyrs who died bloody deaths in the Colosseum. The advent of the Christian faith was one of the major reasons for the Decline of the Colosseum but Christianity was also its saviour. The Colosseum is now visited every year by nearly 5 million people. The content of this Decline of the Colosseum category on life in Ancient Rome provides free educational details, facts and information for reference and research for schools, colleges and homework. Refer to the Colosseum Sitemap for a comprehensive search on interesting different categories containing the history, facts and information about Ancient Rome. Just like the subject of Decline of the Colosseum there is hardly a page of Roman history and the Romans that is not, on some way, connected to the Roman Colosseum which became a symbol of Rome, its society, culture and life.